If you are planning to devote a day of your vacation to The Wizarding World of Harry Potter, you’ll quickly discover that there is more to do at Universal Orlando’s park than can be covered in dozen hours. We’ve had a great response to our recently published Diagon Alley touring plan and one day/two park touring plans, which I encourage you to read if you haven’t already. But an even better way to experience everything Universal Studios Florida and Islands of Adventure has to offer is with these new Universal Orlando two day/two park touring plans. The good news for guests just now getting to Gringotts is that the ride is running much more reliably and with greater capacity than only a couple weeks ago; as a result, standby wait times are peaking in the morning at half their former 450-minute high-water, and dropping to 120 or less by late afternoon. There is still a rush to Diagon Alley every morning, resulting in a queue to enter London for early arrivers. But the return time tickets are rarely needed any more, and crowd control barricades around the area have been vanishing by lunchtime. These plans are designed for guests purchasing park-to-park tickets; those with single-park tickets should use our one-day/one-park plans. Also, while the plans are labeled “day 1” and “day 2” they may be used in any order; general admission guests who are eager to ride Gringotts may want to use day 2 first. Note that this plan is designed for guests without Express passes, such as those staying at Cabana Bay. Guests staying at the three luxury hotels with free Express access will be able to deviate freely from the touring plan after completing the early entry steps, and should encounter minimal waits at most attractions. Return to Springfield and have an early lunch at Fast Food Boulevard. If you prefer a sit-down meal, try Finnegan’s in New York. Bear left out of Springfield into Kidzone, and experience The E.T. Adventure. See the nearby Disaster! before or after the Beetlejuice show, depending on the time. Head left from Hogsmeade Station through the Lost Continent, and explore Seuss Landing. Ride One Fish Two Fish. Ride The Cat in the Hat. Cross through Port of Entry to Marvel Super Hero Island and ride Storm Force Accelatron. Walk through Toon Lagoon on your way to Jurassic Park. Explore Camp Jurassic and the Jurassic Park Discovery Center. Return to Lost Continent in time for a late afternoon showing of the Sinbad Stunt Show (or feel free to skip it). Spent some time chatting with the Mystic Fountain outside Sinbad stadium. Enter Hogsmeade and ride the Dragon Challenge if you dare. Have dinner at The Three Broomsticks. After dinner, explore the shops and windows of Hogsmeade. Ride Fight of the Hippogriff. Following your flight, walk next door to Hogwarts Castle and brave the Forbidden Journey inside. If this is not your first ride on Forbidden Journey, use the single rider line. Alternatively, request a “castle tour” to experience the queue, then exit or ask to transfer to singles. Enjoy the evening atmosphere in Hogsmeade, and explore the hidden details of the islands as you exit. Arrive at the front gates of Islands of Adventure at least 75-90 minutes before the published public opening time, or 15-30 minutes before early entry begins. Follow team members directions through Seuss Landing to Hogsmeade, and ride Forbidden Journey again. Ride Dragon Challenge and Flight of the Hippogriff again if you want. Return to the front of the park before official park opening, and ride The Incredible Hulk roller-coaster. Continue through Marvel Super Hero Island and experience The Amazing Adventures of Spider-Man. Backtrack to ride Doctor Doom’s Fearfall using the single rider entrance in the arcade. Walk to Toon Lagoon and ride Dudley Do-Right’s Ripsaw Falls. Assuming you want to get even wetter, ride Popeye & Bluto’s Bilge-Rat Barges. Enter Jurassic Park and complete the soaking series with the River Adventure. Cross the bridge to Lost Continent (or cut through Hogsmeade if it is closed) and see Poseidon’s Fury. Eat lunch at Mythos (make reservations in advance at opentable.com). After lunch ride the Hogwarts Express back to Universal Studios Florida, and switch to Part 2 of this day’s plan. Check the scheduled times for the Blues Brothers Show, Animal Actors, and Horror Make-Up Shows. Try to arrange to see all three, with the last performance starting around 5 p.m. Between the shows, see Twister, Shrek 4-D and Terminator 2. Return to Diagon Alley and explore the shops and sights, starting with Olivanders Wand Shop, and wait for the show inside. The experience is virtually identical to the annex found in Hogsmeade, but there are three performance spaces so the line should moves at triple the pace; you should rarely wait more than 10 minutes for a show. After the show, purchase an interactive wand if you want to play with the magical effects hidden around the Wizarding World. Ride One Fish, Two Fish. Return to Lost Continent in time for a late afternoon showing of the Sindbad Stunt Show (or feel free to skip it). Spent some time chatting with the Mystic Fountain outside Sindbad stadium. Arrive at the front gates of Islands of Adventure at least 30-45 minutes before the published public opening time. Follow team members directions through Port of Entry to the left, and ride The Incredible Hulk roller-coaster. Ride Forbidden Journey again, using the single rider line. 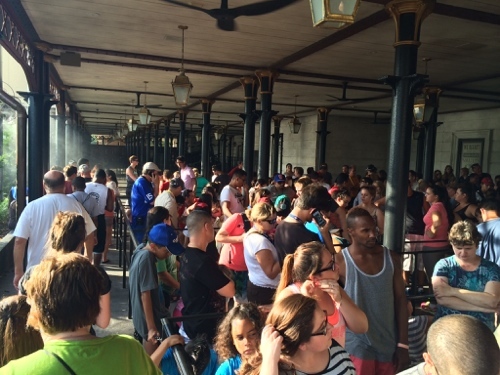 Get in line for Gringotts before the doors close for the night. This may happen as early as 2 or 3 hours before park closing, depending on how long the standby queue is. …and this is why I’m waiting until 2016 before visiting the newly expanded Wizarding World. Great info! I wish you guys would do an article on which rides have what drops, similar to the one you did on the Disney side of things. As a Disney fan, I know that Space Mountain is a “no” for me, but Thunder Mountain is a big “yes!” I plan to visit the Universal this fall for the first time and need to know what to skip! I’m a little confused, I always assumed both parks would participate in early opening (every day) for onsite resort guests. What is going on??? Both parks do participate in early entry every day, but the operating calendar has USF opening an hour after IOA. Therefore USF will starting early entry at the same time that IOA is completeing theirs and opening to the public. I expect this staggered opening to be a test, hopefully short term. What about those with more than two days? We are staying five days in last week in August. I had thought we wouldn’t bother with early entry, my plan was to go to parks right after lunch, ride non HP attractions in the afternoon (as we are staying at Portofino we will have front of line, so there shouldn’t be waits). And then do dinner and after dinner rides in the HP areas, as by then the lines will have dissipated. Do you think this will work? If you have 5 days with express and don’t want to do early entry, don’t worry about a touring plan. Just relax and enjoy yourself! Think the plan will work OK if we flip days 1 and 2? I don’t think we’re going to get in early enough on the first day, then we’re spending the night at Cabana Bay so we should be able to get there by opening the next morning. Should we do the “General Admission” plan instead? Thoughts? These plans were designed for 2 full days in the park, from open to close. 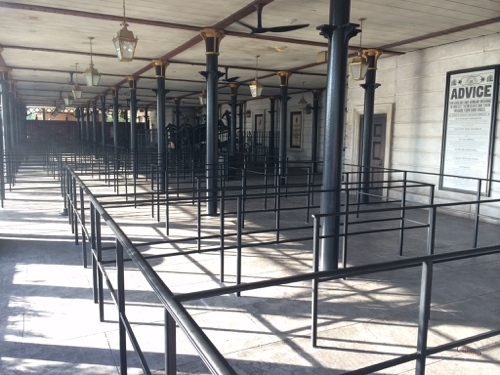 If you can only do early entry on one day and want to ride Gringotts, use it at USF. Depending on how late on the 1st day you are arriving, you may want to use a 1 day plan instead for your full day. Thanks. We’re taking a shuttle from the Wilderness Lodge, but the earliest shuttle is 7:15am so I don’t think we’ll be able to get to the parks for early opening unless we’re REALLY lucky and check-in is quick. Either way, we should be able to get in reasonably early that first day. What do you think of this plan? We are staying at HRH the second weekend in January. On Saturday (I think this will be the busiest park day during our visit) we will arrive at Studios for early admission and plan to go directly to the Hogwart’s Express and ride over to IOA and spend the day there since Forbidden Journey is a constantly loading ride so hopefully when we get there the wait won’t be too long. On the next day, Sunday, we will be there for early admission at the Studios and go directly to Escape from Gringott’s and spend as much time as we want in Diagon Alley. We also have a half park day on Monday and will probably go back to Studios and spend even more time in the newer area etc.. I was curious as to how the lines/crowds are for Hogwart’s Express if you try to ride it after spending a few hours in the respective Harry Potter area? I hope this post makes sense. 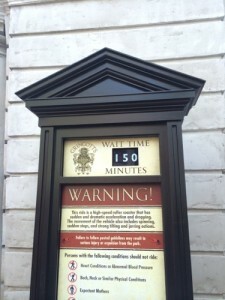 There should be no need to ride Hogwarts Express first thing, it usually has little to no line until afternoon, and rarely goes above 45-60 minutes at worst. If you want to ride FJ during early entry, go straight to IOA and ride the Express later.